Today’s automated and software-driven industries can churn out products with the push of a few buttons. It takes mere seconds to create something that would have previously taken weeks or months of employee hours. The advancement of technology in such areas as 3-D Printing, the Internet of Things, and next generation robotics are leading major paradigm shifts in manufacturing that were unimaginable even five years ago. Not only do these technologies cut costs, they also decrease the time of production, which means more can be made for less. Let’s take a look at some of these innovative technologies that are changing the way products are made. One of the most exciting advancements in manufacturing technology has been the ability to ‘print’ 3-D objects. In December 2014, the International Space Station’s 3-D printer completed its first print job from a design file that was transmitted from NASA’s offices on Earth to the ISS in orbit. The tool produced by the printer was was a ratchet wrench. 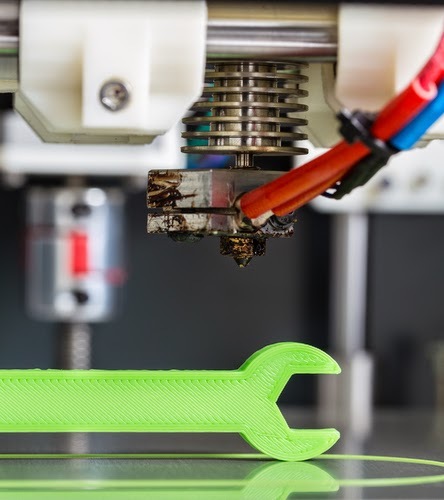 Automotive manufacturers like Ford are now using 3-D printers to build prototypes and make product testing more efficient, while o-ring and rubber seal manufacturer Apple Rubber recently integrated the MakerBot Replicator 3-D printer into its business ops. 3-D printing has captured the imaginations of the general population and the manufacturing community alike, and it has evolved quite rapidly over the last five to ten years that it’s now possible to produce almost any object using metal, plastic, rubber, mixed materials and even human tissue. Advancements in robotics technology are rapidly realizing the vision of full collaboration between humans and machines. As sensors improve and become much cheaper, robots are becoming more agile and precise when interacting with their environments. Meanwhile, improvements in GPS technology now allow robotic technology to do more than work on an assembly line, as these devices can now roam free to work in industries such as precision agriculture to control weeds and complete the harvest. While some have worried that robotics may take the jobs of human workers, it’s much more likely that next-generation robotic devices and machines will collaborate with workers instead of replacing them, and there’s still many a large portion of industries that haven’t even begun to adopt robotics. As Henrik Christensen, Executive Director of the Institute for Robotics, told MIT Technology Review, “In the past, robots have penetrated 10 percent of the industry. There’s still 90 percent of the industry, and that’s where you need collaborative robots.” Even when you take into account more advanced design and potential breakthroughs in artificial intelligence, human ingenuity and intuition will be difficult to replicate and will be necessary to lead most manufacturing endeavors. A major technological breakthrough, the Internet of Things allows electronic devices to connect with each other via the existing Internet infrastructure so they can communicate without receiving commands from humans. This technology is growing at such a rapid rate, it’s estimated that approximately 26 billion objects will be linked together on the Internet by 2020. The major implication of IoT is we will start to see more small machines meant for specialized tasks, rather than large ones that can take on multiple duties. Since devices will be able to ‘talk’ with each other, they will be able to spread notifications in real time. For example, if one device finds a defect or failure, all the other computers will be notified instantly so the issue can be resolved. This refined form of communication will result in less downtime, increased quality, minimal waste, and lower costs overall.